The Mormon Tabernacle Choir and Orchestra at Temple Square present the triumphant and angelic sound of George Frideric Handel’s masterpiece, Messiah. Taking over two years to record, the choir conductor, Mack Wilberg, has painstakingly captured an awe-inspiring version of arguably the best choral work ever written. 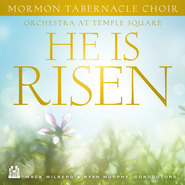 The attention to every detail is impeccable, the vocal performances are unforgettable, and the “Hallelujah” chorus performed by the 360-member Mormon Tabernacle Choir and the 85-member Orchestra at Temple Square will long be considered one of the best versions ever recorded. This single-disc version features 15 popular selections from Handel’s Messiah. In my mind, it is the precision and clarity of this recording that sets it apart so magnificently from so many others. If the big old Tab Choir sound is what you long for, then you already have your recording--this CD doesn't diminish one iota the lushness of the Ormandy version of 1959, and you may keep enjoying that one in perpetuity if you like. This new edition simply spreads even further the reach of this magnificent music to a wider audience more attuned to baroque style and the sounds of our day. And to the Anonymous reviewer who said this recording's precision meant it lacked warmth or sincerity, I would only say that exactness and accuracy are also valid ways of worshiping God who, as Mies van der Rohe reminds us, "is in the details." Where you hear austerity, I hear energy, concentration, unity, and devotion. This kind of unified sound can only be achieved by an unwavering commitment from all performers, and that is itself just as powerful a testimony of their devotion to Christ as any kind of overt emotionality. I've sung Messiah both ways myself--big and uncontrolled, tight and disciplined--and I have to admit that the more it required of me to rein in my individual exuberance in the service of collective beauty, the more I got out of the performance, musically and spiritually. Letting the Choir "have at it," which is what I hear on some other versions, might feel good at the time, but it's basically an indulgence of the individual singers that diminishes the overall impact of the music itself.